Working with a brand always gives insights into the work that goes behind the scenes that one doesn’t see as consumer & I am glad when I get an opportunity to share it with you as part of my skincare product reviews. Dr.Pauline Hili, founder of Nourish Skincare, is constantly working on new ideas, but even with her scientific and suppliers knowledge, product development takes time, sometimes delaying a product launch due to Pauline’s perfectionism. Kale 3D Cleanse, Nourish new revolutionary cleanser, was created based on Pauline’s fundamental belief that everyone should be able to afford organic or truly natural skincare. In a way, this product is an extension of the brand’s already successful product line containing brassica vegetables, namely kale. Kale is a powerful vegetable that contains an enzyme system that helps eliminate environmental stressors and protects skin cells from environmental damage, a fact that more and more skincare brands are starting to address. Kale delivers antioxidants – whether you eat it or apply it topically to your skin, as part of a skincare product ingredient list, as it contains Vitamins A & C, as well as generous amounts of Vitamin K, iron and zinc. I started testing this product last year, as it was in early stages of development. Nourish initially launched it in Australia earlier this year, where Pauline often does stellar TV presentations. 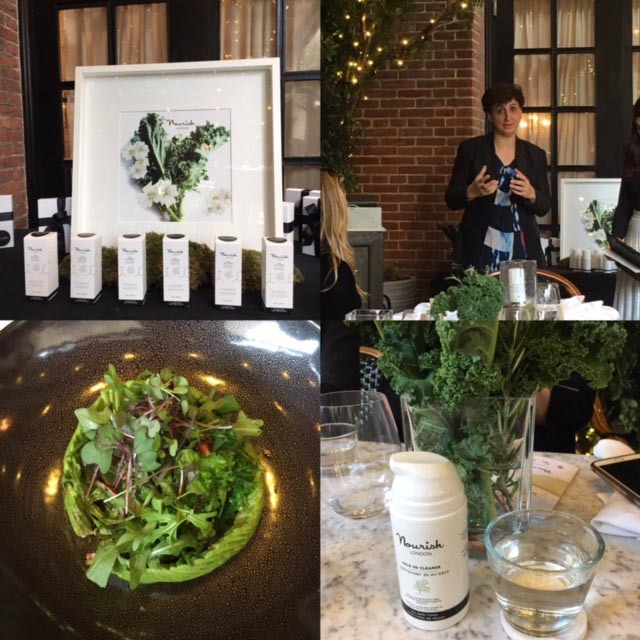 Last month it was finally launched in the UK and Pauline and Nourish team gathered bloggers and beauty experts, as well as brand friends, at intimately cosy Dalloway Terrace Cafe, to talk about the new product in the beautifully calm Bloomsbury hotel. The chef created the most delicious salad with powerful greens ( kale, radish, avocado and pomegranate ), as well as deliciously nutritious smoothies which fuelled our bodies, while Pauline and Nourish fed our brain’s curiosity and amplified existing knowledge. Pauline’s professional background lies in the science field, but one of the things that drives and motivates her is current disengagement between healthy skin and self-esteem. In the digital age and social media & press obsession with ‘perfect’ images, people forget that while out exteriors matter, it is what’s going inside out bodies and minds determines how our skin looks and feels. Our skin comes into daily contact with the atmosphere, which is full of pollutants and environmental aggressors, particularly when we live in big cities. So when creating this cleanser Pauline was thinking about creating a reservoir of protection and giving sallow, tired skin a healthy boost, making sure that skin’s ‘machinery’ works as efficiently as possible. Our skin is a good indicator of our general health, so in addition to wanting great looking skin – who doesn’t want that?- it is important to pay attention to your skin’s health, which at its peak feels smooth, has even tone and is well hydrated. To reduce the potential for damage of your skin, cleansing is possibly the most important part of your skincare routine, particularly in the evening, because it removes airborne pollutants ‘collected’ during the day. On top of that, now most of us have lost their summer tan and with onset of winter almost upon us, our skin is starting to look dull and de-hydrated and is really in need of a boost. Simply put, it needs all the help and support it can get. Basically, this cleanser will help your skin on the road to it being the best it can be. One of the questions that Pauline asked herself and her team when developing this product was how to make cleansing interesting and make sure it offers a deep cleanse, without disrupting your skin’s natural state? In the end what you get is a very cool product with scientific and colour changing capabilities, that lifts impurities off and leaves behind radiant skin. This cleanser allows you to pretty much apply superfoods topically to your skin, so ingredients like Hyaluronic acid, Probiotics and Oxygenating extracts, upon coming into contact with your skin, get to work synergistically to energise and refresh you skin, as this facial wash lifts make up and grime off your complexion. Kale and Griffonia detoxify and protect against pollution, helping to minimise signs of ageing, but no less importantly they, plus Pomegranate, form an enzymatic system that prevents ‘sticking’ of pollution particles to your skin. Pauline stressed during the presentation how important it is to protect skin’s lipid layer, so you won’t end up with ‘leaking bucket syndrome’, when no matter how rich the moisturiser, your skin will look and feel dry, contributing to the process of premature raging. Never underestimate the importance of using the right skincare for your skin type and bear in mind the negative impact external environmental aggressors have on our skin day in, day out. At the end of the day, apply a drop of Kale 3D Cleanser onto damp skin and add water. Start to gently massage your face, until the colour of the cleanser changes from white to green, which is your signal to rinse it off with cool water and examine your complexion with a satisfied smile in the mirror. Below is the image of my hand, not my face, with the cleanser on its own on the left and mixed with water and massaged on to the skin on the right, so hopefully you can see the difference between ‘before’ and ‘after’. This cleanser’s fresh, herbal smell is refreshingly uplifting and hopefully your skin will feel the same way after using it, like mine does. Last, but not least, cast your eyes over Nourish updated and more modern packaging, that reflects that the brand stays true to its roots, yet marches on with the times. Ingredients: Aqua, Sodium cocoyl isethionate, Glycerin**, Stearic acid, Cetearyl alcohol, Titanium dioxide (CI 77891), Alginic acid, Helianthus annuus flower extract*, Brassica oleracea leaf extract*, Aloe barbadensis leaf juice powder*, Griffonia simplicifolia seed extract, Lactobacillus bulgaricus ferment filtrate, Pelargonium graveolens flower oil*, Ethylcellulose, Iron oxide Yellow (CI 77492), Mica, Sodium levulinate, Olibanum (frankincense) oil*, Hydroxypropyl methylcellulose, Commiphora myrrha (myrrh) oil, Glyceryl undecylenate, Rosmarinus officinalis flower oil*, Glyceryl caprylate, Levulinic acid, Sucrose, Chromium oxide Green (CI 77288), Leuconostoc/radish root ferment filtrate, Sodium hyaluronate, Populus tremuloides bark extract, Eugenol, Linalool, Citral, Geraniol, Limonene, Citronellol. *Certified organic. **Organic origin. Naturally present in essential oils.